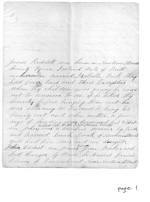 The owner of this document is descended from George Riddell of Philadelphia (1843-1931), who arrived in Philadelphia from Ireland in 1856. There is no signature on the document. There are no dates in the narrative. 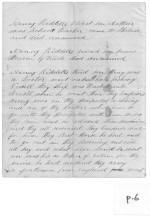 However, several of the listed names have been located in 1860 & 1870 U.S. Census records. 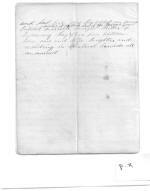 Therefore Jeff has deduced this document was written around the 1870s. 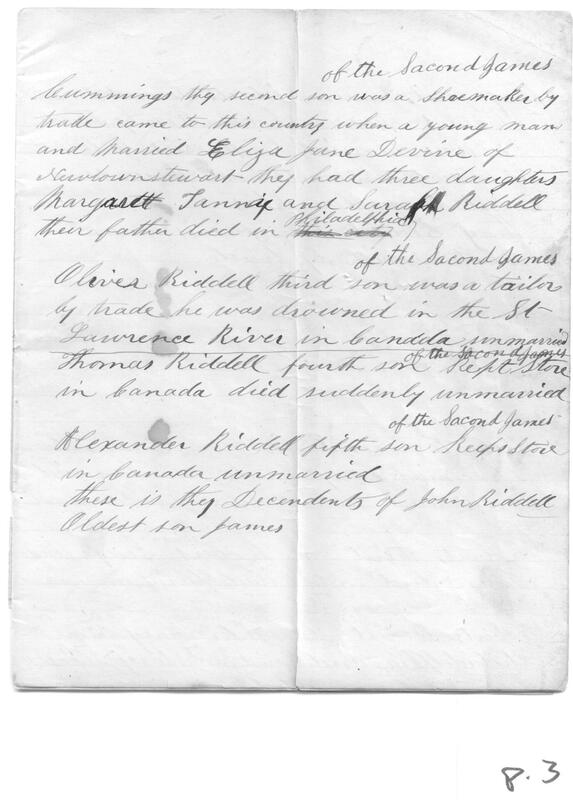 One of the listed sons of James Riddell was found on an 1832 passenger list, aged 40, which could set James Riddell as born in the 1750-1770 period. 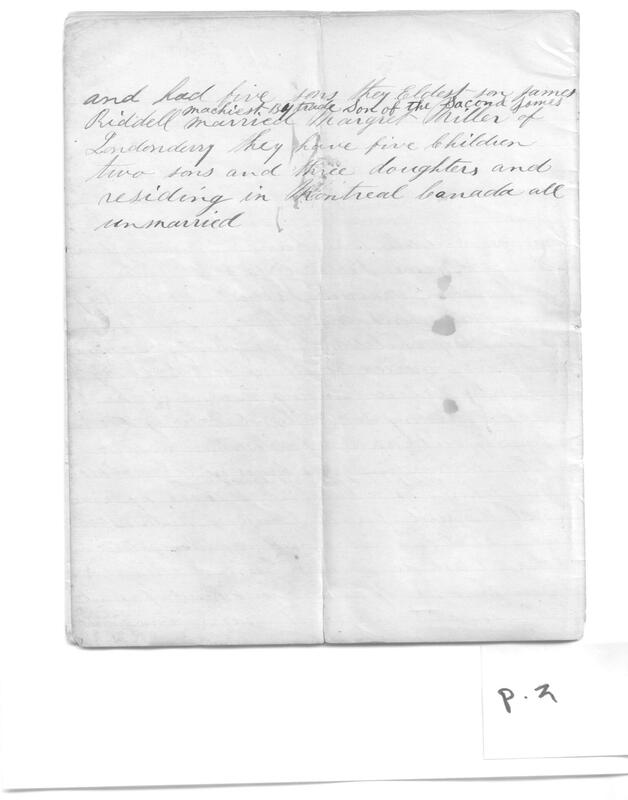 This document is transcribed as is using the wording and spellings contained in the actual document. 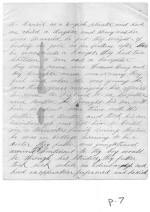 Please click on the images for a larger version of the page. James Riddell was born in NewtownStewart County Tyrone date of Birth unknown married Isabelle Park they had four Sons and Three Daughters when thy children was young he came out to America to see if he liked thy Country before bringing them out – he was returning to Ireland to bring his family out and when within a few days of landing was drowned his eldest son John, eldest son of the first James Riddell, was a Cambric weaver by trade and married Sarah Doak of NewtownStewart and had five sons and one daughter. 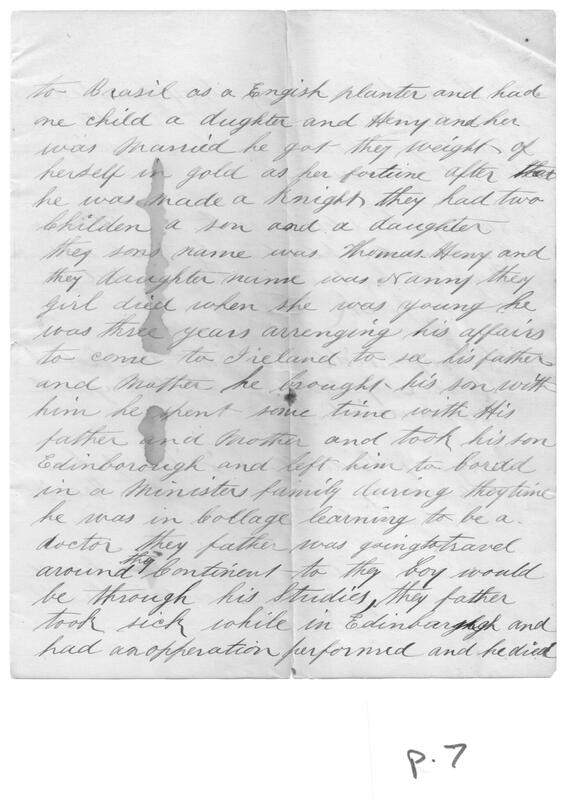 and had five sons they Eldest son James Riddell machinist by trade Son of the Second James married Margret Miller of Londonderry they have five children two sons and three daughters and residing in Montreal Canada all unmarried. Cummings thy second son of the Second James was a Shoemaker by trade came to this country when a young man and Married Eliza Jane Devine of Newtownstewart – they had three daughters Margaret Fanny and Sarah Riddell their father died in Philadelphia. 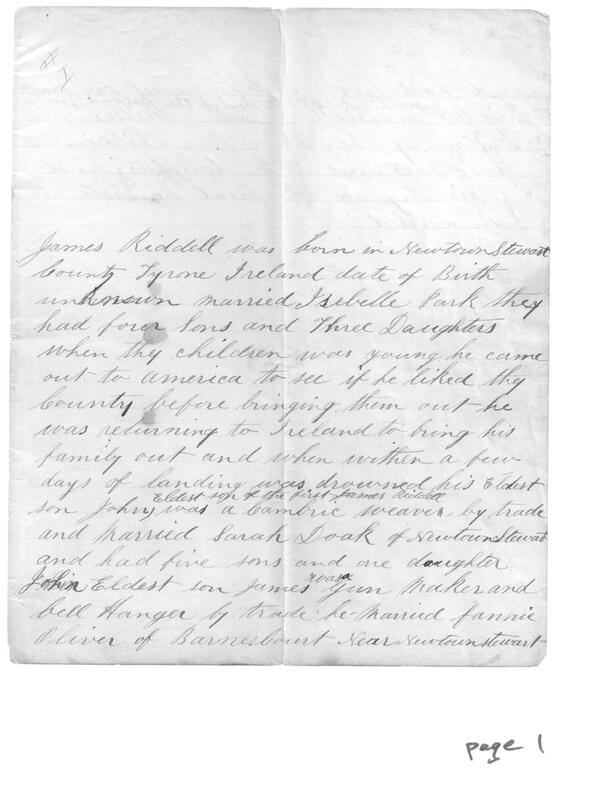 Thomas Riddell fourth son of the second James kept Store in Canada died suddenly unmarried. 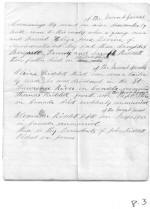 Alexander Riddell fifth son of the second James keeps store in Canada unmarried. these is they decendents of John Riddell Oldest son James. 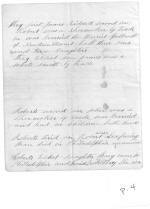 They first James Riddell second son Robert was a Shoemaker by trade he was married to Harriet Galbrath of NewtownStewart, had three sons and two daughters. They eldest son James was a white smith by trade. 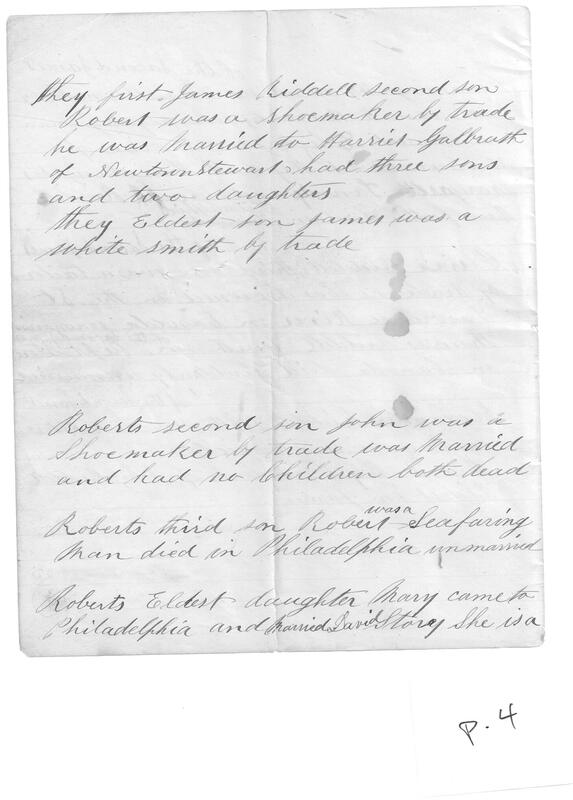 Roberts third son Robert was a Seafaring Man died in Philadelphia unmarried. Widow lady living in Philadelphia. Roberts youngest daughter Ann came to Philadelphia and married. She is dead and left two daughters. 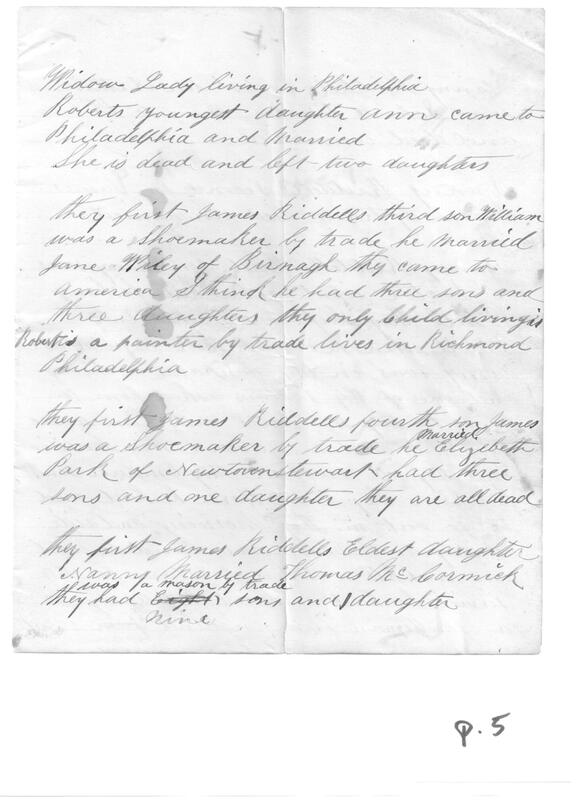 They first James Riddells third son William was a Shoemaker by trade he married Jane Wiley of Birnagh they came to America. I think he had three sons and three daughters they only child living is Robert a painter by trade lives in Richmond Philadelphia. They first James Riddells Eldest daughter Nanny Married Thomas McCormick – was a mason by trade – they had eight nine sons and 1 daughter. 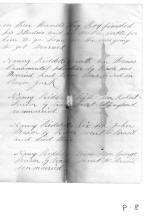 Nanny Riddells Eldest son Arthur was School teacher came to Philada and died unmarried. in their hands. The Boy finished his Studies and his mother wrote for him to go home for She was going to get Married. Nanny Riddells fourth son Thomas Ornamental plasterer by trade was Married had two sons lived in New York. 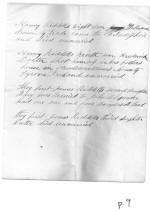 Nanny Riddells fifth son Robert Tailor by trade went to England unmarried. 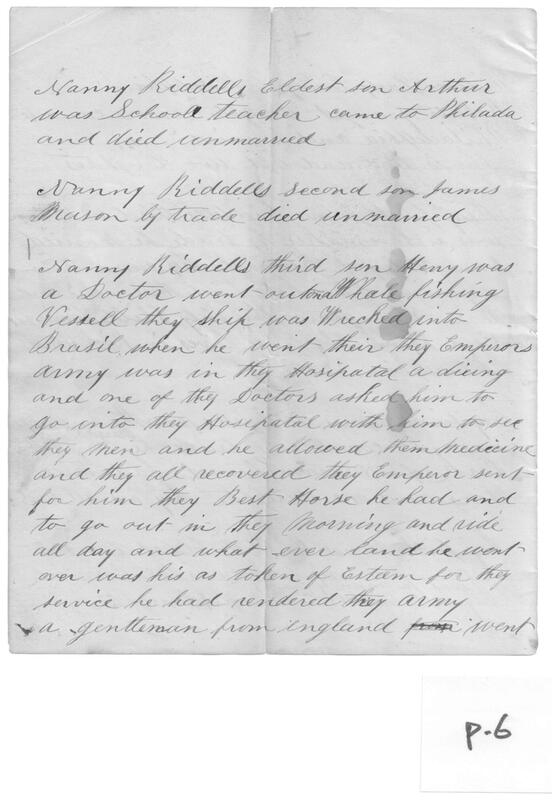 Nanny Riddells Six son John Mason by trade went to Brasil and died there. 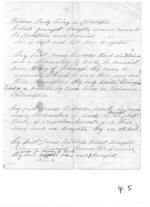 Nanny Riddells Seven son George Mason by trade went to Brasil unmarried. 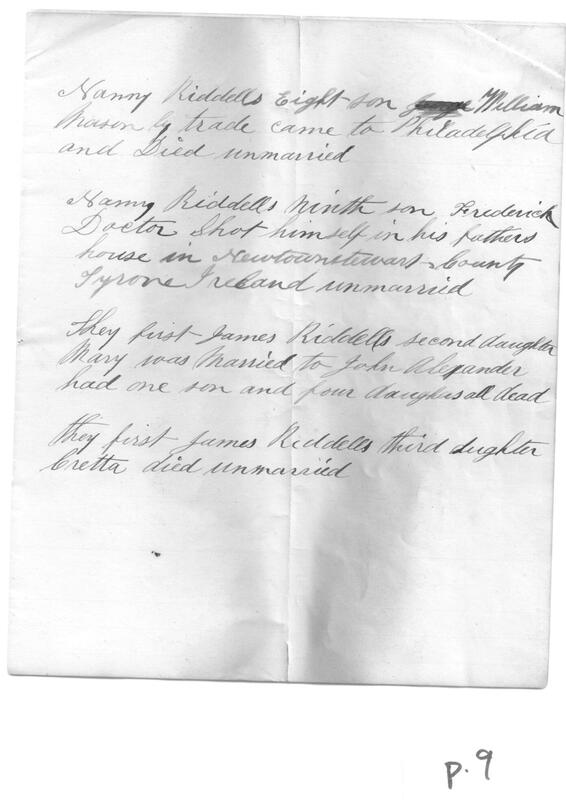 Nanny Riddells Eight son William Mason by trade came to Philadelphia and died unmarried. Nanny Riddells ninth son Frederick Doctor Shot himself in his fathers house in Newtownstewart, County Tyrone Ireland unmarried. The first James Riddells second daughter Mary was married to John Alexander – had one son and four daughters all dead.